A hearty appetizer that is bursting with flavor. In a medium bowl, mix together all of the pico de gallo ingredients and refrigerate. 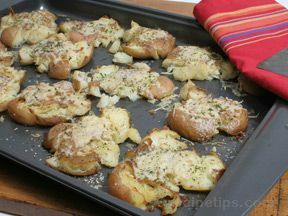 Place potatoes in oven and bake for one hour or until the are fork tender. 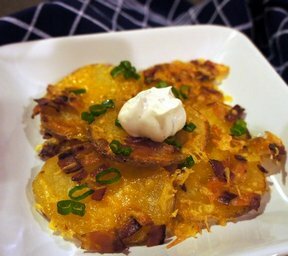 When they are cool enough to handle, cut the center 1/2 inch from the potato by slicing twice. One slice on the right side of the middle and one slice on the left side of the middle. This will leave you with three pieces; two edge pieces and one middle piece approximately 1/2 inch thick. You do not need need the middle piece for this recipe. Save it for a different potato dish. Turn the oven to 450°. 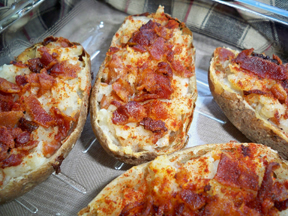 With a spoon, scoop out the inside flesh of the potato skins, leaving approximately 1/4 inch on the sides. Spray the whole potato with non stick cooking spray. Place on a cookie sheet cut side up and bake for 12 minutes or until the edges begin to brown. 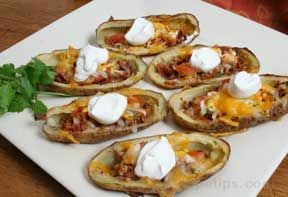 Sprinkle a small amount of cheese on each potato skin. Sprinkle on the bacon and top with one tablespoon of pico de gallo and the remaining cheese. Place back in the oven for a couple of minutes or until the cheese has melted. Serve warm with sour cream and pico de gallo.